It’s not often T-Mobile tweets about an upcoming device but this time they are doing a little teaser for HD2 fans everywhere. “Think you know the HTC HD2? Guess again…Stay tuned for more next week.” Now, after analyzing this a little (translation, reading it twice) I honestly don’t think we are going to see a launch next week as the rumored March 24th date seems to line up with a “Spring” launch. However unlikely, it would be awesome. It’s possible we’ll learn pricing, release date, meaning of life and perhaps something regarding future Windows Phone updates. At this point it’s anyone’s guess and I think we are just better off speculating, because well, it’s just more fun that way. Noooooooooo!!!!!!!!!! I have too many apps! If it’s true that my old apps with not run on WM7, WM7 now would not be a good thing! its gong to be a very long time before windows 7 hits the consumers. probably q4. it will be showed off at the mobile world congress though next week. This phone would rock if it ran Android. There, no need for anyone else to say it. That line is more worn out than “It is what it is”. It is a Windows Phone, now get over it and move on. If you want an Android HD2, go follow the Supersonic elsewhere. David, good job not jumping the gun like everyone else. There is no reason to believe that this phone will be released next week like the Facebook fan page indicates. Tmo employees won’t even begin training for it until the 17th. That’s assuming that they start with the HD2. That being said, I will be beating down the door of my local Tmobile store the minute it is available. I’m glad I am not alone. Not that I dislike Android as a OS, but now I am just completely annoyed by it’s fans. If they want the Android version, go to Sprint. They’re getting the HTC Supersonic which basically is the HD2 with Android. And who says that this will be released next week?? ……. That single Tweet probably creates more buzz and excitement than any advertisement T-mobile has done. They need to use the web more for generating sales and excitement. Its a better tool than TV at this point. Agreed 100%. I’ve been following news about the HD2, as many others have. But that one little Tweet just renewed my excitement. Man, I can’t wait! The web is OK, but you’re marketing to a limited number of people. Definitely not reaching as many customers. i spoke to a t-mobile rep yesterday and he said there was talk around t-mobile that said the HD2 would be around $450 unsubsidized. Now if thats true i wonder what the contract price would be. I can’t wait for this phone to come out, March 24th seems far away. the retail isnt really $700, he was telling me thats how much it is over seas, because they give the phone for free with a contract, so the price of the phone out of contract is alot to compensate. plus t-mobile knows not many people will buy the phone for $700. even AT&T lowered the prices on the iphone 3Gs…because of competitors and the economy. the nexus one has most of the same hardware and its unsubsidized price is $529…so in the ballpark of $450 is belivable. You mean in Europe, right? If so, European prices have nothing to do with U. S. pricing. My Touch Pro2 was priced at about $650 to $750 in Europe. When T-Mo debuted it here, August 2009, it retailed for around $550. As I said before, but I have nothing to go on except my thoughts on the subject, here in the U. S. I think the “default” high-end price for smartphones is going to settle at around $550, but no more than $600. And as I said before, I think the HD2 is less costly to manufacture than the Touch Pro2 (since the Touch Pro2 has a complex physical keyboard). While the HD2 has a Snapdragon processor and more RAM, those components would not drive up the HD2’s manufacturing costs all that much. Add that to the fact that the Nexus One is somewhat similar in tech as the HD2 will be, I think its retail cost is a good indicator on what it will cost to get an unsubsidized HD2. Since I will have to pay full price for the HD2 I am hoping I am wrong on my high price estimate and that others are right on their low price estimates. I’d be real thrilled if retail is $450. $450? No way, no how. I was thinking $550. $450 is on the outside of believable. I hope they learned their lesson with the TP2, and watching Google flounder with the Nexus One at $530 (hardware wise the Nexus One is comparable to the HD2). I hope your rep is right. At $450 it’ll be the first time I ever waited outside of a store for it to open. Can’t see them bundling the 16GB microSD card for that price though. So if your rep is right, I wonder if they’ll be 2 levels of pricing w/microSD and wo/microSD. LOL… that would be nice. I’d tell them keep your 16GB and sell me the HD2 for $50 less. As I mentioned before, my concern is that they are tossing in the 16GB chip to 1) justify a high price by saying “but look at all the stuff you get; and/or 2) to make the nightly news. Hearing all the news broadcasters talk about your phone is the stuff dreams are made of and usually gets the marketing department a huge bonus. It may be both. 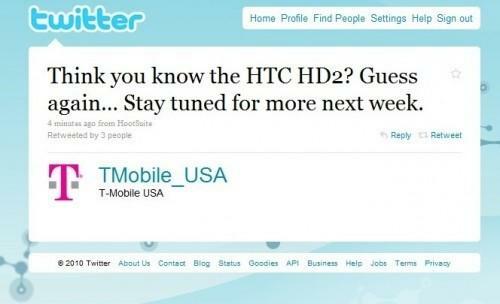 I still say that T-Mo has big plans for debuting the HD2. And assuming it’s a dry news week for technology stories, you can bet with specs like those being hinted and debuted by T-Mo, the HD2 will be the talk of all the news channels. I bet this will be the biggest launch T-Mobile has ever had. Sidenote: I am calling T-Mo to see what I need to do to return my BlackBerry 9700 pursuant to buyer’s remorse. (Keys are too close for me to type on, at least fast and accurate). I will pump the CSR for any news on the HD2. Will report back if I get anything good or interesting. @Guerrilla: Dude don’t rely on what a rep tells you in regards to future phone releases, future prices, and so on and so forth. Hope you still have fingers left by the time the HD2 comes out. Would be very nice if they released it next week, but I won’t hold my breath. If I were to guess I would say they are going to talk about the new features they added. Another thought…Maybe they will open up pre-orders next week? That would be nice. There it is…just what I was thinking. Pre-orders, just like they did with the My Touch. I have signed up for info on this phone through htc’s website, which links to a T-Mobile website to be kept in the know. I would expect an e-mail next week stating this same thing. it be great if they had a change of heart and put Android on it lol..
You need a new crystal ball. The phone retails for over $700. Expect the 2yr price to be at least $299-$349 to compete with the iPhone 3GS pricing. You are quite optimistic. Keep in mind the Touch Pro 2 is currently going for $269.99. This phone won’t go for a penny under $299.99 and even that might be low. If I remember right the TP2 was $349.99 when it launched. This news will make for a VERY long weekend of speculation and anticipation. I for one will be glued to my computer come 9am Monday morning for the press conference. I wouldn’t want WM7 if it takes away the Sense UI. Please let it be WINDOWS MOBILE 7!!! I think it’s definitely Windows Mobile 7. MWC is next week, which is when 7 is expected to launch. That lines up perfectly. I bet HTC has already customized Sense for WM7 and is launching the US version of the HD2 with the update already installed. That’s my official prediction. I’m more in accord with your thinking, check this out dude….. According to sources cited by the Wall Street Journal, Microsoft will announce the next version of its Windows Phone platform at Mobile World Congress next week in Barcelona. The Journal’s sources say, “The operating system sports a revamped user interface that resembles the look of Microsoft’s Zune HD music player and is designed for devices with touch-sensing screens.” No more details about the OS were shared. Microsoft only recently admitted to the existence of WinMo 6.5.3, a stop-gap between WinMo 7 and WinMo 6.5, which was introduced in October 2009. WinMo 6.5.3 hasn’t officially reached the market yet. HD2 will be T mobile Zune phone. As far as price, I expect at least 349.99 w/ 2yr. I said it before and I’ll say it again, WM7 on the HD2 with TMo. One thing I heard is that MS will be supplying reference hardware “chassis'” for OEMs to build around. I like the idea. It’s like a ‘middle way’ between the Death Grip control that Apple promotes and the anything goes of the old Windows Mobile (I know they had reference hardware requirements before, but they didn’t actually supply specific hardware). I like it. But whether the HD2 build will be one of these is hard to say. Or the HD2 will be a wild card and a bit of a beta for the OS. I wonder if they are planning on having Android running on it? I wish everyone would STFU about “I wish it had Android”, it doesnt, so get over it! this phone is gonna be ridiculous when it launches! whether it launches with WM6.5 w/ Sense, or w WM7 its still gonna be an awesome phone! I love Android just as much as the next guy, but its not the end-all, be-all of phone Operating Systems! Whatever……I wish it had Android!!! It would be cool if they were launching T-Mobile TV (kinda like Sprints version). wouldnt it just be crazzy if it did actually have a bit of android in it like the android market!!!!!!!!! Wm has its own app store as well as all the freeware sites. Although the HD2 will be launching with WM 6.5 (possibly WM 7) it would be super awesome if this had Android! And yes…it doesn’t. So what, we can comment and voice our opinions however we like. @Guerrilla: Why don’t you shut YOUR piehole..you donkey! Anyhow you can say whatever the hell you want and voice your arguments for or against. However you like I ain’t bothered it. This is an open comment area. And if you’re bothered by what some would want with the HD2..that’s your problem. BTW…I think you’ll “agree” with me…HD2 would be awesome with Android. Is it safe for me to assume that T-Mobile will never the high powered Android phones that we all crave, but I will take this and convert to Windows! My trackball says windows 7, i may cop one depending on the price! Let’s be honest this is maggie and microsoft. they tease us and give us what we all already know but repacked. The big news imho? It runs wimo 6.5! It has Sens! etc. let us remember “project dark” they are not that badass to do something truly shocking. Now as for the price on this bad boy. I think 599/650 for uncontracted plan and 299/350 for two years. either way I’m buying that doggie in the window! I’ve spoken with a couple of store reps and tech reps on the phone and they’ve all said that this phone should launch “shortly” after WinMo 7 drops. Based on the previous “high end” phones they’ve launched, I’d expect it to be about $350 on contract. This price was also not officially confirmed, but one rep gave the old wink and nudge when asked directly about that price. We’ll see. Some of us are HAPPY this phone won’t run android. Some of us don’t like the idea of syncing our phone’s contact data to “the cloud.” As far as Don’t Be Evil and company, they are a corporation therefore anything they say is subject to rebuttal and revising. what did they say about the non contract price? Those of us who use Blackberries are happier people. No drama about what OS a phone has or don’t have, if it’s 3g or not, how big the app store/world is or multi-touch or not. The only thing BB users are ever concerned about is memory loss and battery time. We BB users also have a major advantage that neither WM or Android has, we have UMA. WM and Android, knock each other out…BB will still be around. My Curve will soon be a paper weight since international calls over Wi-Fi are no longer free. Just got a text from Tmobile about it today. No worries though. I will just use skype when I get my HD2. WM7!!!!!! Ohh and just wondering if tmobile will air any tv ads before it comes out…..? Seriously, if this phone released next week, I would need a new pair of Britches for me Trousers. Lol!!! I just speculated in my pants. I’m budgeting myself to snag two no-contract versions of this on Mar. 24th, I’m not ready for it to drop next week. I doubt that’s the case though, especially considering that they’ve yet to send any emails to those of us who are tracking the HD2 with t-mobile. They officially state the upgrades they’ve made over the euro version, maybe highlight the pre-packaged apps (tetris, guitar hero, swipe), state the pricing, and state the release date. All of which will be included in the first email to all of us HD2 trackers. Oh good grief. See my posts from over 3 months ago that talked about when the HD2 will debut (April 2010) and my guess 2 months ago that it will have WinMo 7, and my recent posts about pricing, $450 to $500 retail, maybe $550, and $275 to $350 on a two year contract. That Tweet is not meant for people who hang on here. It’s for people who have not kept up on the phone, meaning plain old consumers. There’s probably about 2000 people nationwide who hang on these boards and talk about HD2. I find it hard to believe that T-Mo would tweet to so few people. T-Mo has bigger plans than talking to us. LOL. And ditto on the ha ha. No, the HD2 is not going to have Android. No, it’s not coming out next week. No, they are not going to disclose prices. Of course, I’d love to be wrong (except on the Android part. I want WinMo 7, not Android). The t-mobile HD 2 specs are clearly stated on HTC’s website. Im clueless to what else they could be talking about? If it doesn’t have a keyboard, like most android phones, I couldn’t care less about it. still on track with dumping my G1 this fall and heading to Spring and the Pre. Don’t want to but T Mobile isn’t giving me many choices. Have you used Swype? I just got it on my TP2 and it’s so fun to type on. With the capacitive touch and large screen of the HD2 + Swype by default you won’t need a keyboard. This is coming from a guy that always thought he needed a keyboard and got the TP2 because of that.